The cork forests of the western Mediterranean region are among the most biodiverse ecosystems on the planet. They are home to over 13,000 species of plants and animals, and several endangered species; and they are wintering grounds for the migratory birds of northern Europe, including virtually the entire European population of common cranes. 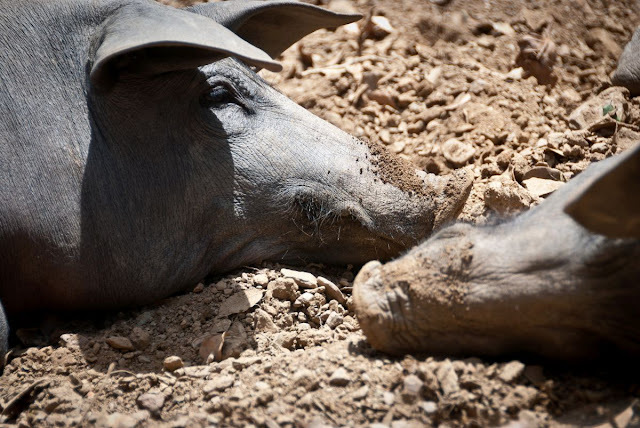 They are key to defending the arid climates of southern Europe and North Africa against forest fires and erosion. And we should be exploiting them more. Cork is a miraculous material. It’s lightweight, fire-resistant and virtually soundproof. It’s also almost impermeable to liquids and gases. These qualities make it the ideal material for any number of purposes. There’s a cork in every Western concert flute to seal the air in and assure a good sound; and there’s a cork sphere at the heart of every regulation Major League baseball. Patrick Spencer of the Cork Forest Conservation Alliance would like Major League Baseball to be proud of this fact, but he suspects that, when baseball fans hear the word “cork,” they think about corked bats and cheating, so the cork in that baseball just keeps doing its impressive job to little acclaim. (My unscientific survey of two avid baseball fans suggests that he’s right: when I used the words “cork” and “baseball” in the same sentence, both of them immediately started to talk about corked bats.) The insulating properties and light weight of cork have made it useful to the aerospace industry. In a TED talk that he gave in 2014, Spencer pointed out that cork doesn’t burn at temperatures below 1,000 degrees, and so for thirty years the designers of the space shuttle used it to insulate fuel tanks and protect the shuttles during reentry. 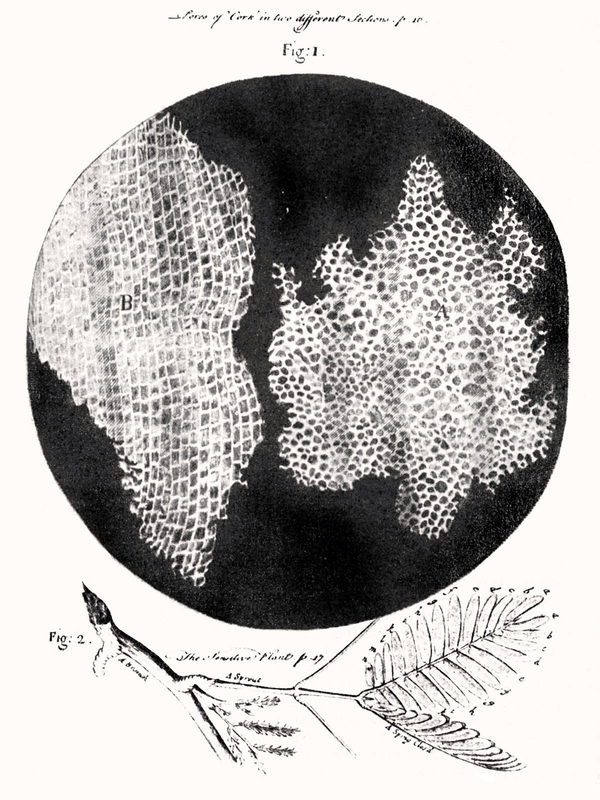 Robert Hooke’s Micrographia, published in 1655, shows the honeycomb-like chambers of cork. These led him to apply the word "cell" to a biological specimen for the first time. 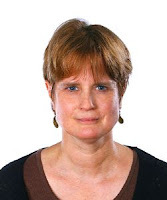 Of course, the fact that a natural resource is useful in a mind-boggling variety of ways is not, in itself, enough to justify ratcheting up its exploitation. But there’s something very special about cork: when it’s harvested, no trees are cut down or even harmed. The cork oak (Quercus suber) is unique: already back in the 1st century CE, the natural historian, Pliny the Elder, wondered that the thick bark of the cork oak “if removed grows again.” And so, the bark can be harvested every 9-12 years – as soon as it’s thick enough to make bottle stoppers; and there’s no lasting harm to the trees. Harvesters cut into the bark with a specialized axe called a garlopa, and then peel the bark away from the tree by hand. No power tools are used. No power tools could be used: they’re not delicate enough for the job. The whole process looks a bit like removing the peel from an orange, with the obvious difference that an orange can’t regenerate its own peel. And here’s the kicker: all plants absorb carbon dioxide and so provide some remediation of the climate change mess we’re creating; but a cork oak absorbs an enormous amount of carbon dioxide, and a harvested cork oak absorbs 3–5 times more than one that isn’t harvested. By far the most widespread use of cork is and has been to seal bottles of wine. 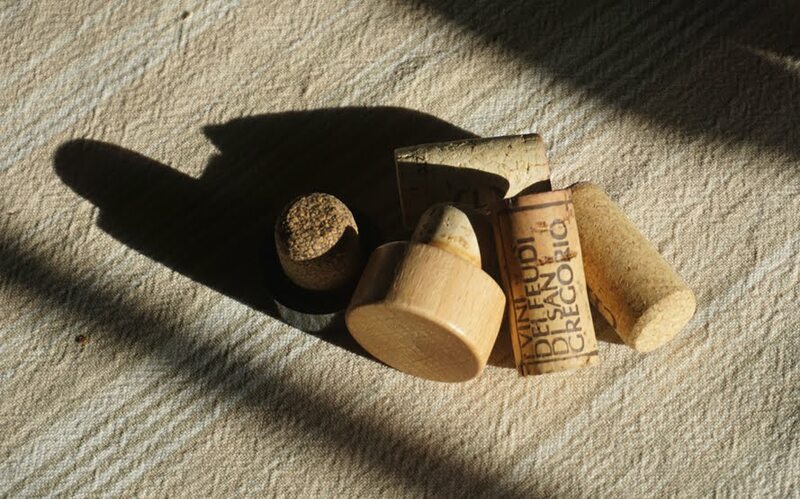 These days, some 70% of the cork market is for bottle stoppers. The literature and archaeology of the ancient Mediterranean both make it clear that cork was already stopping wine containers thousands of years ago. In the 1630s, Sir Kenelm Digby devised something approximating the modern wine bottle, and he fully expected that that bottle would be sealed with cork. A few decades ago, cork stoppers became a widespread source of anxiety to wine drinkers and to the wine industry: a small but not negligible number of wine bottles were affected by what was popularly – and now it seems somewhat unfairly – called “cork taint.” “Corked” wine is not in any way dangerous, but has an unpleasant smell – and therefore an unpleasant taste – that’s usually described with similes of wetness: it smells like a wet dog, or a damp basement, or a soggy book. Spencer tells me that, before the cork industry and its allies did research on the origins of that unpleasantness, “the cork was always the culprit.” He believes that there was a sensory element to this scapegoating: you could actually sniff a cork and smell the taint – so of course, people reasoned, that must be the source of the problem. Except that it wasn’t – or not entirely. That wet-dog smell is caused by a chemical compound called 2,4,6-trichloroanisole, or TCA. One way it can form is when the chlorides of bleach and other sanitizing agents meet up with naturally occurring fungi. And that means that you might find TCA on a cork, but you might also find it in barrels, in plastic hoses, on wood, or on any substrate that might serve as a kind of petri dish for the fungi. Spencer tells me that TCA has been found in contexts where the wine bottles are being closed with aluminum screwtops. And TCA is tenacious: once it establishes a foothold, it’s difficult to get rid of. Faced with this competition for the market in bottle stoppers, the cork industry – along with universities, research centers, and forestry NGOs – kicked into high gear, did a lot of research, and identified a number of methods for reducing the incidence of TCA in wine. Some of those had to do with how cork bark was harvested, treated and stored. Spencer tells me that major cork companies are now able to offer TCA-free cork, because they use gas chromatography to scan every single cork. The wine industry has not been as thorough, but many wineries have eliminated the use of chlorine for sanitizing and sterilizing equipment. Here, though, the story becomes a tale of two regions. Spencer believes that the cork landscapes of Spain and Portugal are now in relatively stable condition – that not too much cork forest has been lost there in the last decade; but the situation in North Africa (Tunisia, Algeria, and Morocco) is a matter for concern. The cork forests and the industry there don’t currently have the support they need. The worldwide reduction in the market means that the countries of the EU are now able to meet most of the demand, so the cork from North Africa isn’t needed. Diminished demand means that the economic benefits of harvesting are not obvious to the governments and people of North Africa. Spencer reports that, in Morocco, he saw harvested cork lying unused on the ground. People need to survive, so instead of harvesting the trees, they’re using them for firewood. So next time you buy a bottle of wine, skip the screwtops: they’re too small to recycle; they’ll just end up in a landfill anyway. Raise a glass to the happy pigs of Iberia, and if you don’t finish the bottle right away, put a cork in it.